The LEGO Foundation recently announced a $100 million grant to Sesame Workshop to support children affected by the Rohingya and Syrian refugee crises. The LEGO Foundation is the charitable organization affiliated with LEGO Group owners, and is itself a 25% owner of the LEGO Group. The grant is being disbursed over the following 5 years, with funds being released as milestones are met. The partnership with BRAC, the IRC (International Rescue Committee) and New York University’s Global TIES for Children will reach children affected by the crises with play-based learning opportunities. Iron Builder competitions have a way of bringing out some crazy creations…suppose that it the whole point of them. 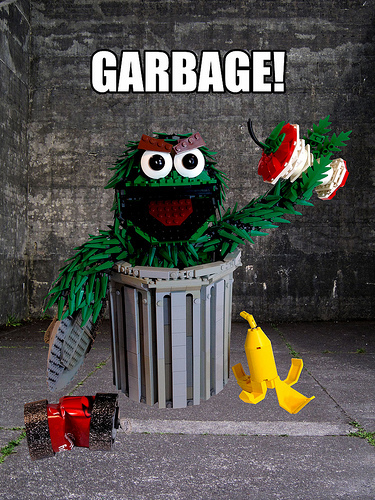 Sean & Steph Mayo prove once again that they have mad LEGO skillz with their adorable Oscar the Grouch. We’re going to hold off posting new LEGO models this weekend as we celebrate the life of Mike Crowley, who passed away on Tuesday in Boston. In the meantime, we hope you enjoy selections from Mike’s prolific and brilliant LEGO output. 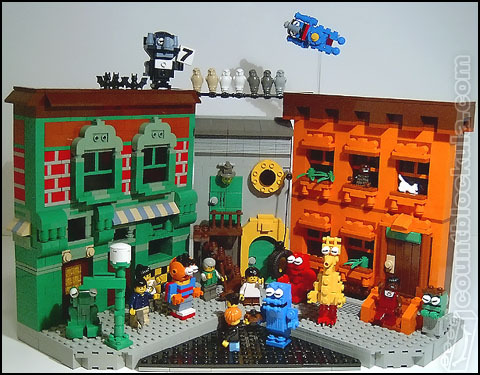 Mike’s Sesame Street diorama doesn’t just feature really wonderful, brick-built renditions of the iconic Jim Henson characters. The backdrop is also full of interesting techniques, like the bricks on the green building. According to my original blog post about this, Mike built this back in February 2006.